Objectives: To determine the effect of postoperative permissive anemia and high cardiovascular risk (HCVR) on postoperative outcomes. Methods: The Veterans Affairs Surgical Quality Improvement Program and Corporate Data Warehouse databases were queried for patients who underwent major vascular or general surgery operations. Patients were classified as HCVR if they had history of Ischemic Heart Disease, Peripheral Arterial Disease (PAD) or stroke); or underwent a PAD-related operation. Primary endpoint was a composite of mortality, myocardial infarction, acute renal failure, coronary revascularization, or stroke within 90 days postoperatively. Results: We analyzed 142,510 procedures performed from 2000-2015. Postoperative anemia was the strongest independent predictor of the primary endpoint whose odds increased by 47% for every gm/dl drop in postoperative nadir Hemoglobin (95% CI: 45%, 49%). 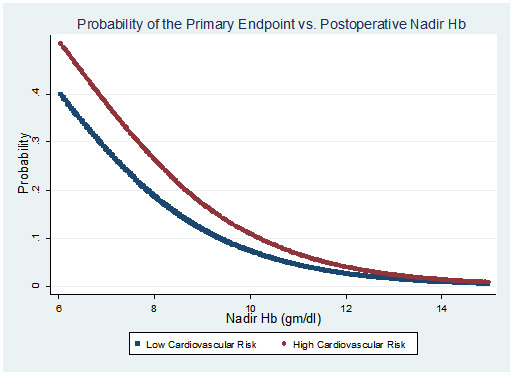 HCVR also independently predicted the primary endpoint (Figure 1), with an additive effect particularly evident at postoperative nadir Hemoglobin values below 10 gm/dl (Figure 2). Postoperative anemia, after age, was the second strongest independent predictor of long-term (12 years) mortality (HR: 1.18, 95% CI: 1.17, 1.19). 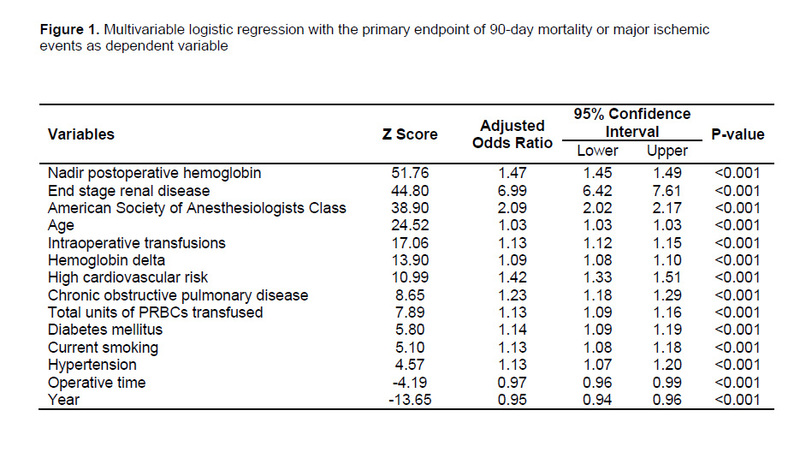 Conclusions: Postoperative anemia is strongly associated with postoperative ischemic events, 90-day mortality and long-term mortality. Restrictive transfusion should be used cautiously after major general and vascular operations, particularly in patients at HCVR.